EDWARD HAND. 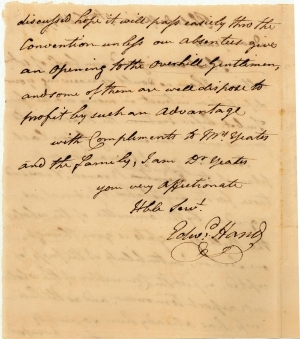 Autograph Letter Signed, to Jasper Yeates, February 4, 1790, Philadelphia, Pa. 2 pp., 6¾ x 8 in. 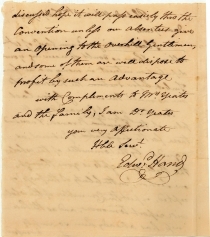 Dr. Edward Hand (1744-1802) commanded troops in the battles of Long Island and Trenton. As Adjutant General of the Continental Army, he assisted George Washington in the siege of Yorktown, and was a member of the board convened by Washington to investigate Benedict Arnold’s treason. After the war, Hand resumed the practice of medicine. 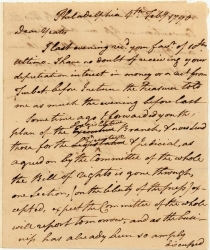 He served as a member of the Confederation Congress (1784-1785) and the Pennsylvania Assembly (1785-1786), as well as a Delegate to the convention for the 1790 Pennsylvania Constitution. Jasper Yeates (1745-1817) was a successful Lancaster attorney who was selected as a delegate to the Pennsylvania convention for considering the U.S. Constitution. He was a Federalist, and he supported like-minded Republicans in Pennsylvania politics such as Hand, who sought to reform the state constitution. Yeates was later a justice on the state Supreme Court, and he published the Reports of Cases Adjudged in the Supreme Court of Pennsylvania, 1791-1808.